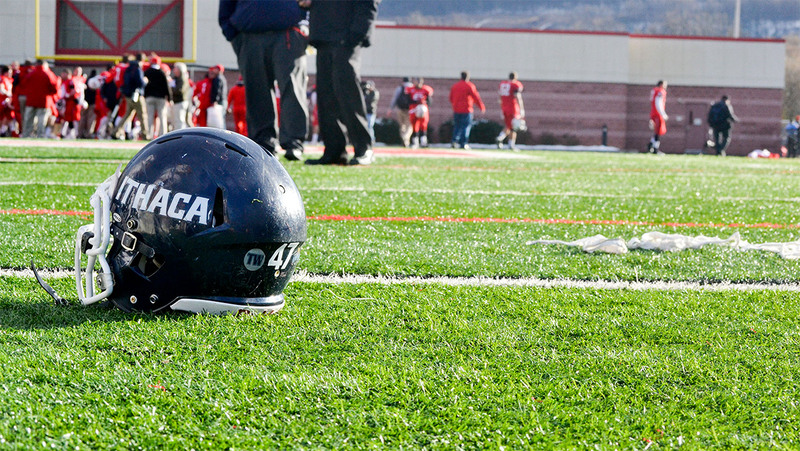 The Ithaca College football team defeated Salisbury University 27–17 Nov. 18 in the Scotty Whitelaw Bowl in Newark, Delaware. The Bombers scored 20 unanswered points in the fourth quarter to secure their first postseason win since 2013. The Blue and Gold entered the final quarter of play down 17–7 with their only score coming off of a 1-yard run from sophomore running back Isaiah D’Haiti. At this point in the game, they were without defensive coordinator Michael Toerper who was ejected for extensively arguing with a referee, and junior wide receiver JR Zazzara who was ejected on the next drive for an altercation with junior linebacker Tom Montag of Salisbury, who was also ejected. After stopping the Sea Gulls on fourth down with five minutes and 49 seconds remaining in the game, the Bombers began to mount their comeback with a seven play, 67-yard drive that ended with freshman quarterback Wahid Nabi connecting with senior wide receiver Jared Bauer for a 27-yard touchdown. Bauer was named Most Valuable Player for his performance in the game, catching five passes for 120 yards and a touchdown. The Bombers forced a three–and–out on the Sea Gulls’ next drive and then found the end zone in just three plays. Nabi found Bauer on consecutive plays of 21- and 34-yards and then senior running back Tristan Brown hit paydirt from five yards out to take the lead. Junior safety Tyler Kishbaugh sealed the win for the Bombers on the first play of Salisbury’s next drive with an interception of freshman quarterback Jack Lanham with 55 seconds left in the game. Brown finished out the contest by breaking a 57-yard touchdown run for his eighth rushing touchdown of the season.